I have read all 3 The Hunger Games books by Suzanne Collins 4 years ago when they were released in my mother tongue because, back then, I couldn’t read in English well enough to understand the story. So, since I have read the books quite a long time ago, I couldn’t remember the exact events to the smallest detail. However, this made the movie even more enjoyable for me because I knew that something big was going to happen but didn’t actually know what and could be as excited as other non-readers. The visuals, the scenery and the special effects were great. Cinematography was done by Jo Willems. The film was edited by Alan Edward Bell and Mark Yoshikawa. The district 13 looked exactly as I have imagined it. The musical score by James Newton Howard as well as Katniss’s song were also special additions to the film. Moreover, the whistling of the Mockingjay theme is my ringtone and I jump every time somebody calls me. 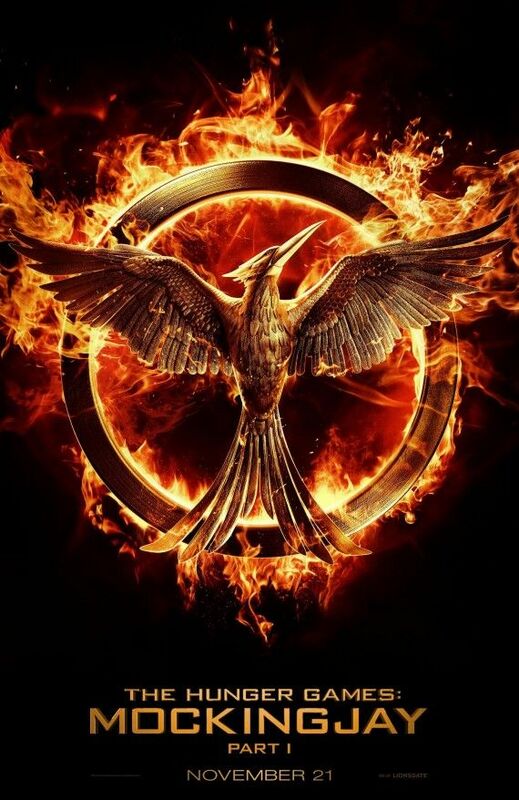 The director Francis Lawrence did an amazing job as with the 2d film .I wish he would have directed the 1st film as well, but they probably will reboot The Hunger Games in 20 years, so he might get his chance. I have already mentioned one of my favorite touching moments – that Katniss’s song about a hanging tree. I loved how the people sang that song while going to a fight. Plus, the hospital scene and the hand sign sent shivers down my back. All the propaganda videos also contained powerful messages that were touching and terrifying at the same time. Jennifer Lawrence was amazing as Katniss as you would expect. I have so much respect for Lawrence as an actress and I will always be a huge fan of her and will go to see any movie she is in. Katniss is an idol to so many girls in a contemporary world. We can all find a piece of ourselves in her. I can relate to Katniss because we are both stubborn and don’t give up without a fight even if we know that we might definitely lose or at least het hurt in a process. Of course, I haven’t faced the challenges that Katniss has faced with but I channel her strength, energy and power to fight my own everyday battles. Josh Hutcherson as Peeta: Josh had a chance to shine as an actor and he delivered for sure. Even though you saw him only through a double screen, his eyes, and his facial expressions portrayed so many emotions. And the physical and mental changes he went through were also mind boggling. Liam Hemsworth as Gale: I really enjoyed Gale as a character, just wish he would have gotten more screen time. Although, the scene where he is talking about the destruction of the district 12 was an extremely powerful moment. Sam Claflin as Finnick: I am a huge fan of Sam Claflin. (Review of his last film Love, Rosie here). I really wanted to see more of Finnick on screen. The way he delivered the monologue which was used as a distraction was amazing. His eyes showed so much hate and so much disgust towards capital, although, behind the toughness you could see that he was hurt deeply. Woody Harrelson as Haymitch: It was strange to see Haymtich sober but I loved his and Katniss dysfunctional/ loving relationship. Elizabeth Banks as Effie: Effie has undergone so many changes through the franchise. Both her looks and her way of thinking changed tremendously. And I have to say – for the better. She looks so much better without the wigs and the make-up and the puffy dresses. Also, we all know that she grew up in the capital and her ability to see that the capital needs to be destroyed gives me hope that other capital citizens will turn to the good side too. Philip Seymour Hoffman as Plutarch: I have a strong admiration for this actor’s work and I was really sad when I’ve heard the news about his death. The world lost a remarkable talent who will be missed. Julianne Moore as President Coin: Moore’s performance was great. I have two completely different emotions when talking about her character. I understand that she has to be a cruel and serious president in order for the rebellion to succeed. However, her intentions seem shady to me. It might be the problem only for me because the one thing I can clearly remember from the book is that Coin is not what she seems to be. Donald Sutherland as President Snow: I have such strong and hateful feelings towards Snow. He is a natural dictator. The biggest problem is, however, not his decisions as a dictator but the pleasure he gets from making them. Natalie Dormer as Cressida: Natalie is such an intelligent young woman who I admire. I have recently seen the press conference and a few interviews with her about this film and she is so well spoken and so smart. I am also a huge fan of her on Game of Thrones. Cressida was the most relatable character for me because I would like to make movies one day and I can understand that the events in real life and through a camera lens look completely different. I also loved Willow Shields as Primrose and Stanley Tucci as Caesar. Willow grew as an actress alongside her character and Tucci is amazing with fake acting. This movie has so many meanings and so many layers. You can talk about it without a break. The first and the most obvious theme is the fight against dictatorship. Throughout history my country has been occupied several times, and since I am familiar with my country’s history, I can understand the cruelty, the insanity and the inhumanity of dictatorship. But history has already happened and we live in a now and we are dreaming about the future. This film hits the audience right where it hurts: if we don’t take actions to preserve democracy, we will end up under the iron fist of a dictator once more in a near future. You can also draw similarities between the movie and the current actions in the Middle East, Africa, Ukraine and other countries where rebellions are rising and where people are fighting for their beliefs. I just wish their beliefs would be based on facts and not speculations and I only want the people to know what they are truly fighting for. Another theme of the movie is the power of propaganda and the media. As I have said, the camera lenses can manipulate the truth and turn it into a weapon. Another theme that stuck in to my mind was the inner fight of Katniss. She is dived between her personal and public goals. She wants her nation to be free but she also wants to be happy with Peeta or Gale. I have recently written an essay in my Literature class on this topic and I have come to the conclusion that you cannot succeed in both spheres, you have to pick one. And Katniss still haven’t made a clear decision but she will do it in a 4th film. These are the main themes I wanted to discuss. However, the film has so many more details and metaphorical meanings. Every character’s ark is full of examples that we can learn from. For instance, Effie shows us that the upbringing isn’t the only thing that defines a person. Gale’s story ark is all about the ability to cope with the losses and the understanding that sometimes it’s enough to be your best self. All in all, since I am a huge fan of THG, I can’t give it a bad review even if I wanted to. But I don’t want to! I loved the movie, the themes, the acting, the visuals and, basically, everything about it. The story was smooth and it had flown perfectly, I couldn’t divide the movie into 3 separate acts. Although, some scenes could have been longer and some actors could have gotten more screen time. But I am not complaining, this was only a Part 1 and they were just laying the ground work for an epic closing chapter to this worldwide phenomenon.